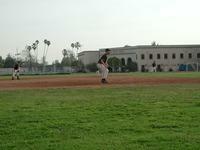 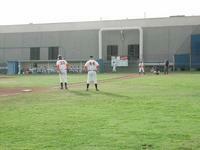 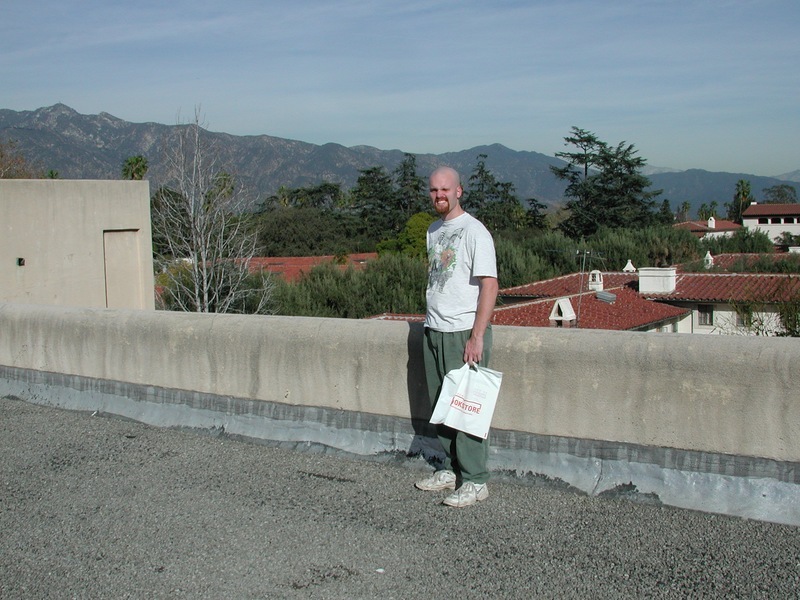 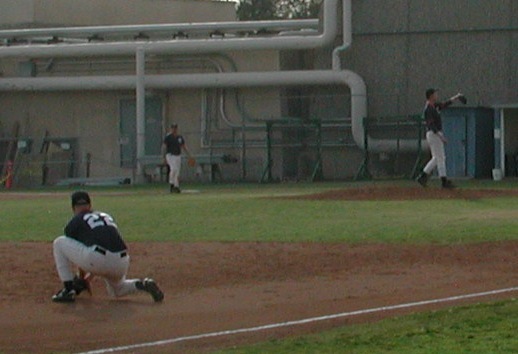 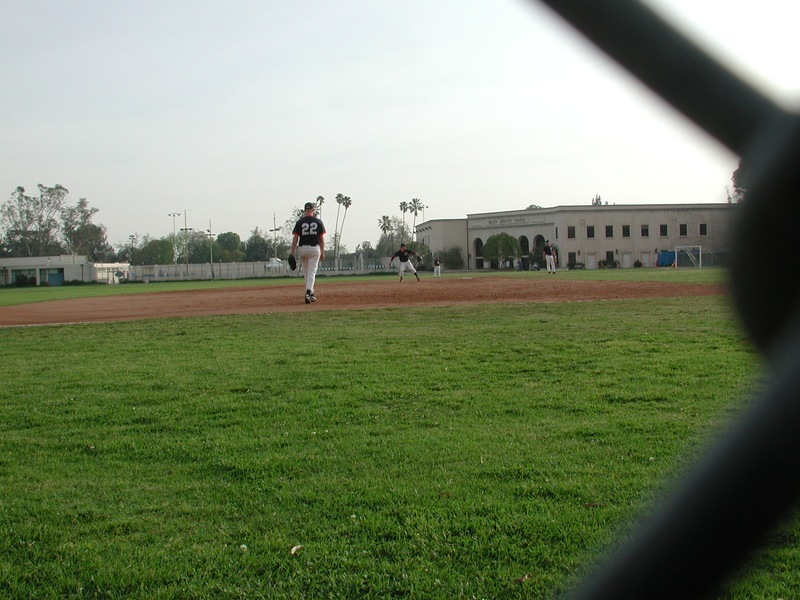 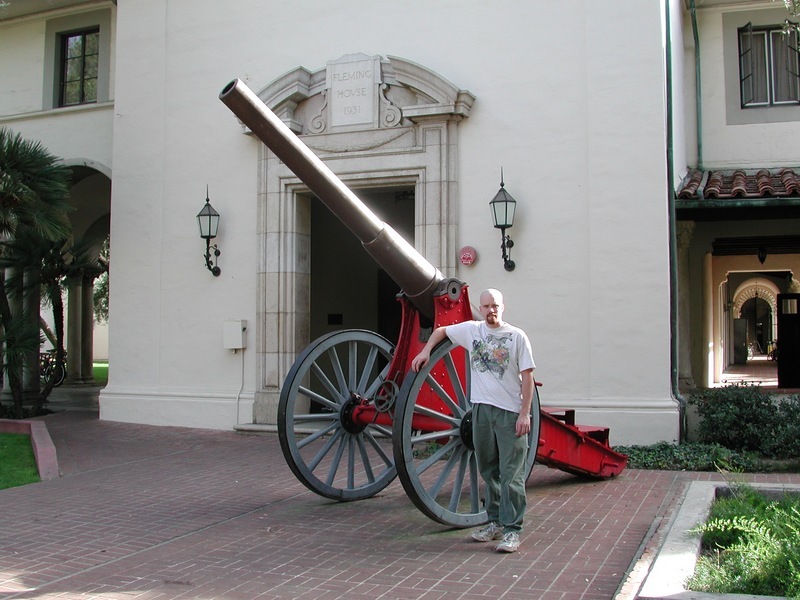 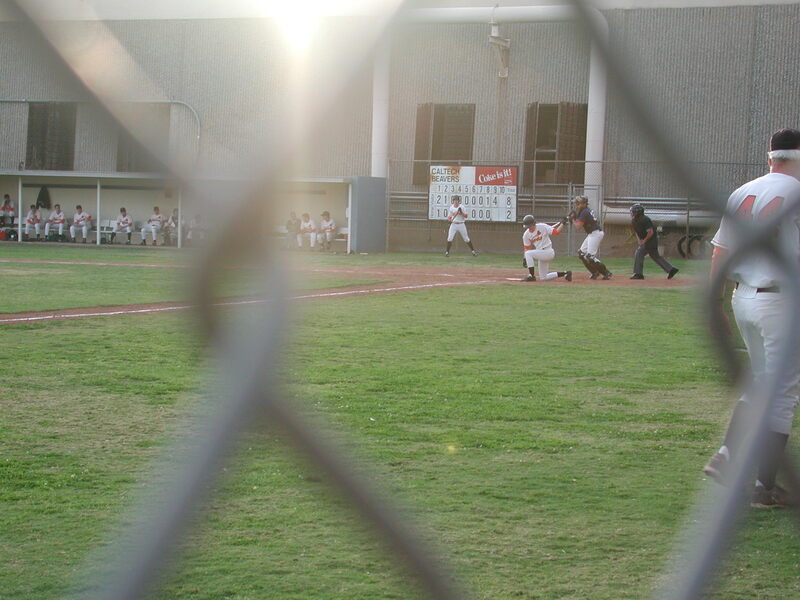 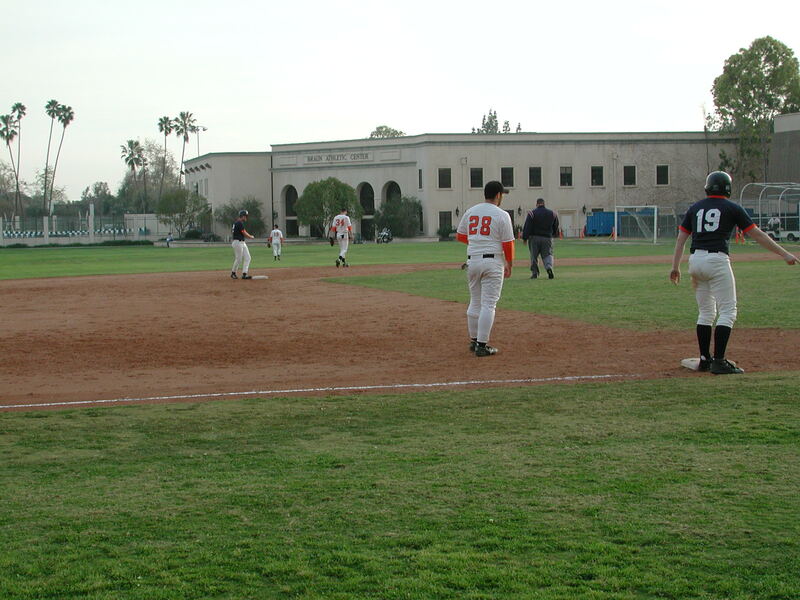 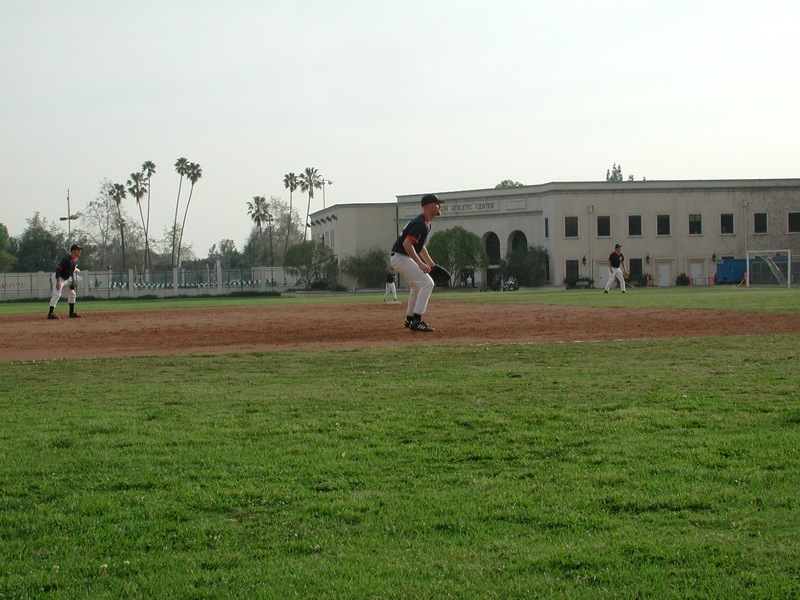 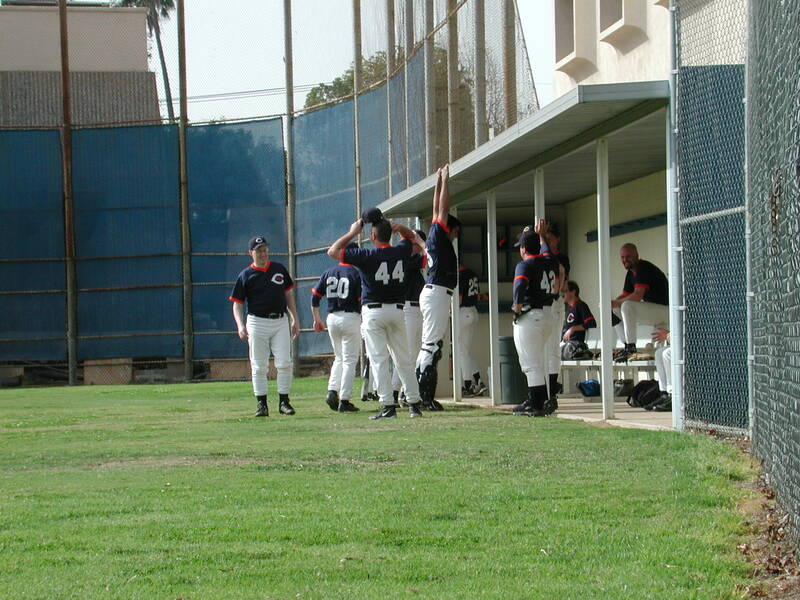 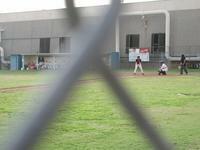 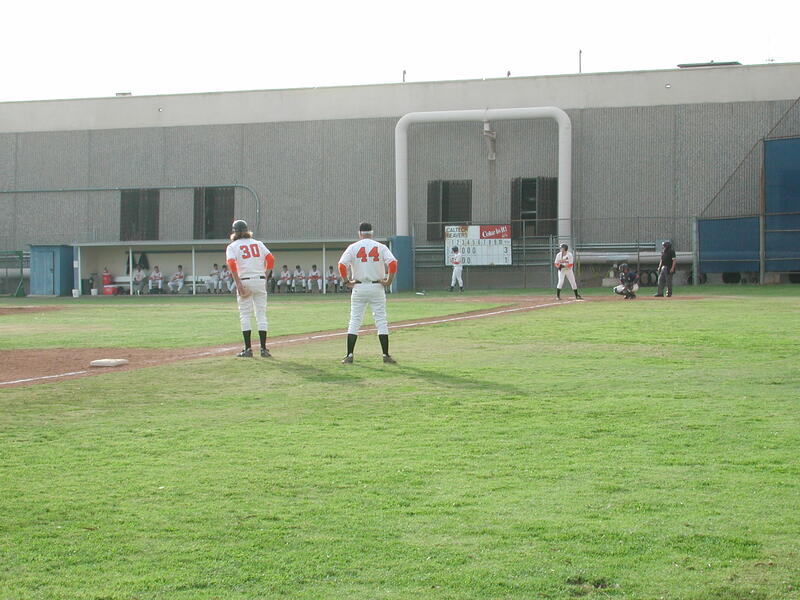 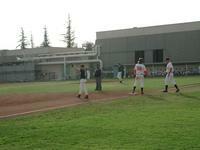 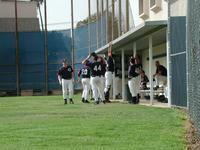 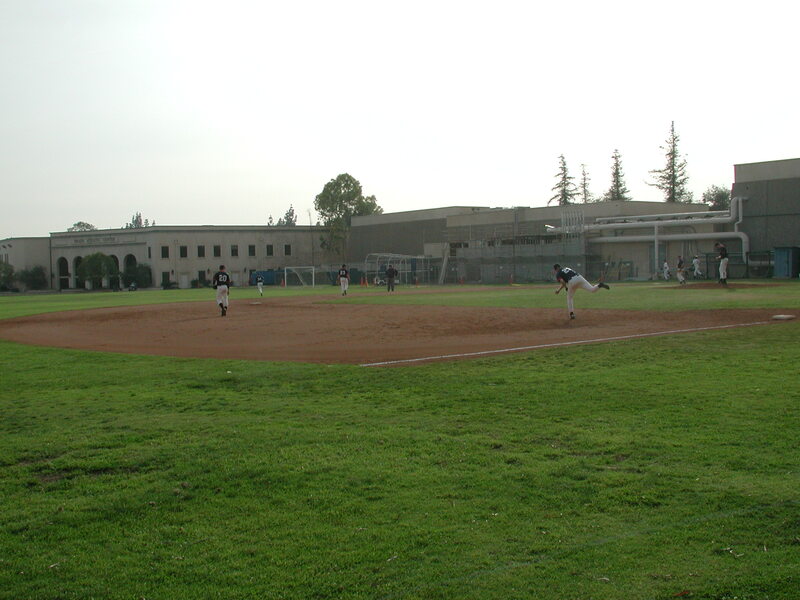 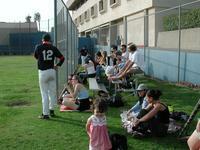 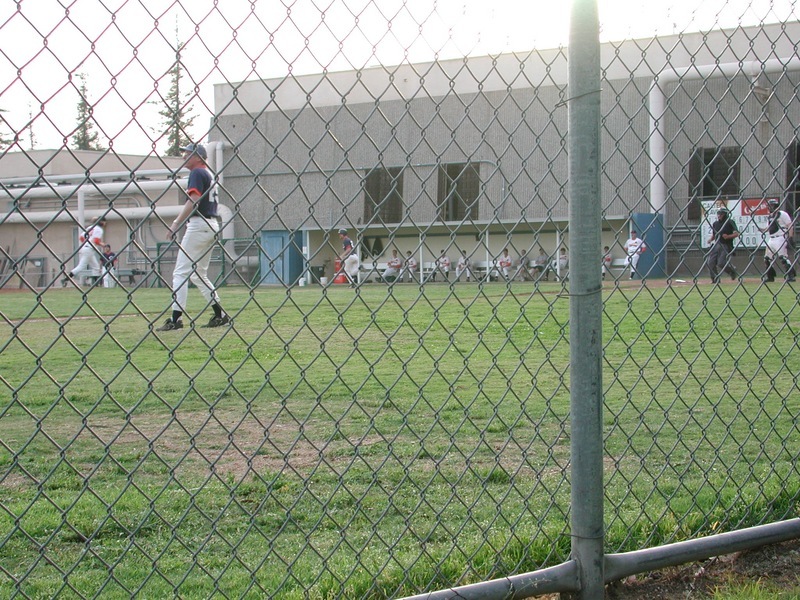 Each year, alums of the Caltech baseball team are invited back to play the varsity. 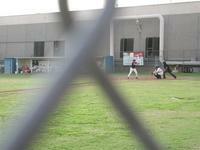 This was my first time participating in the game -- I went 1 for 3 with an RBI. 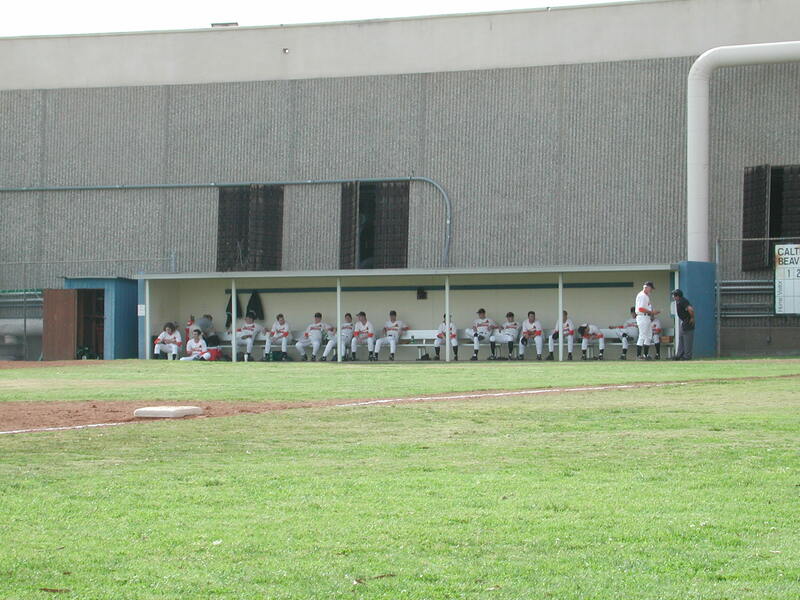 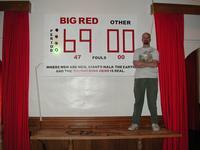 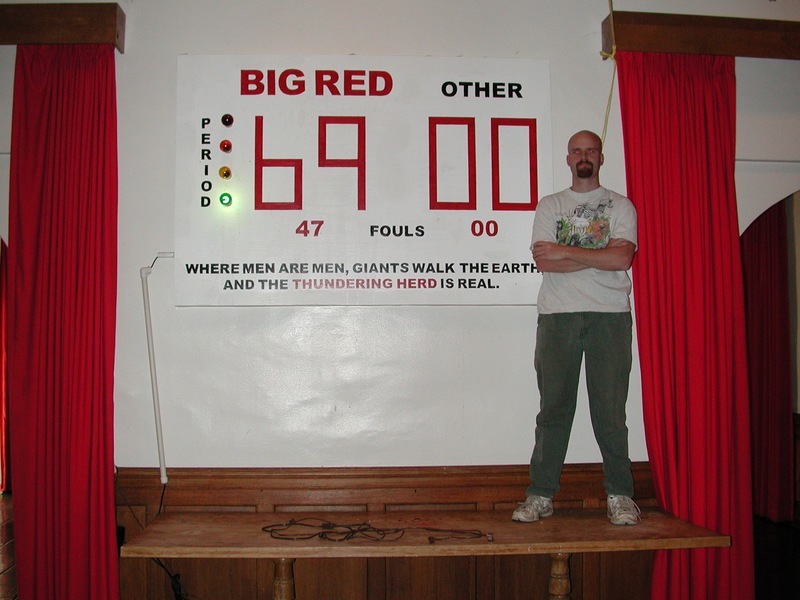 Me sitting on the visitor's bench before the game. 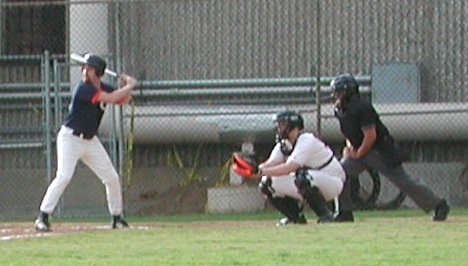 My first at-bat: a sharp fly out to left field. 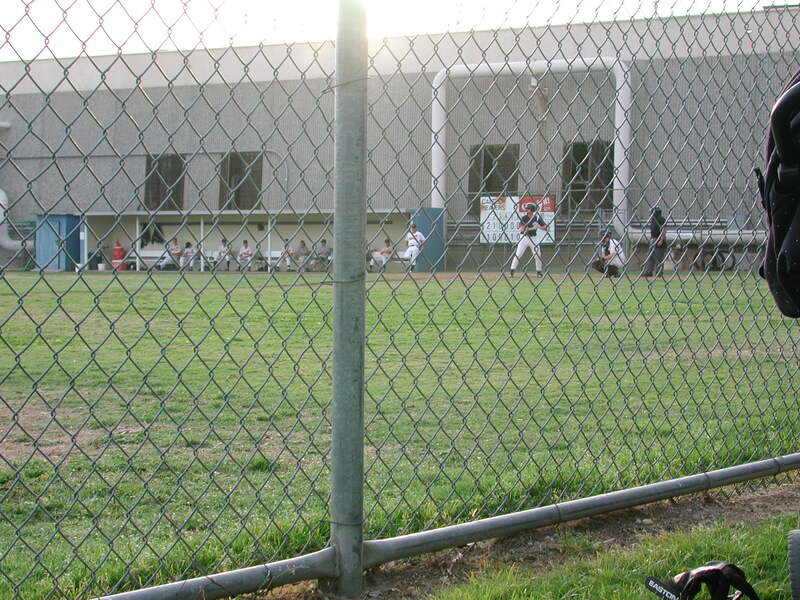 The view from the stands. 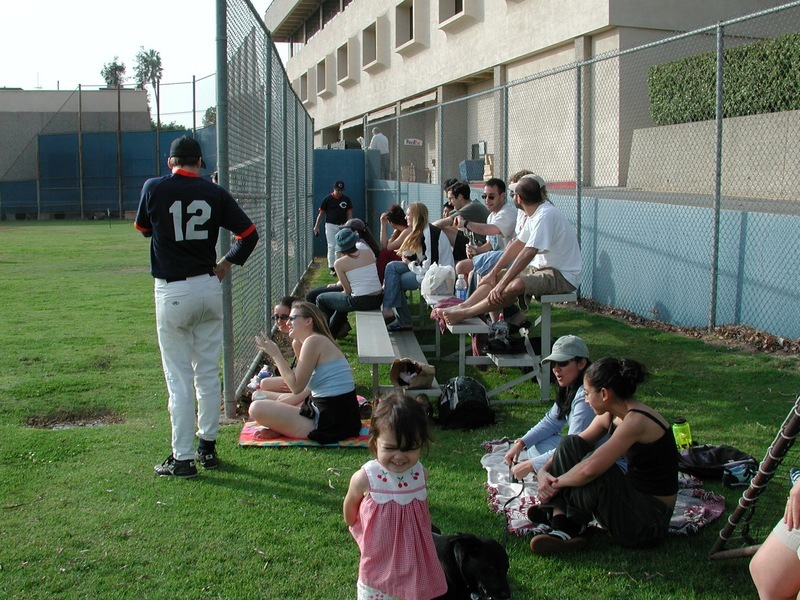 The spectator in front row, all the way to the left, in the blue shirt, is Coop's woman. 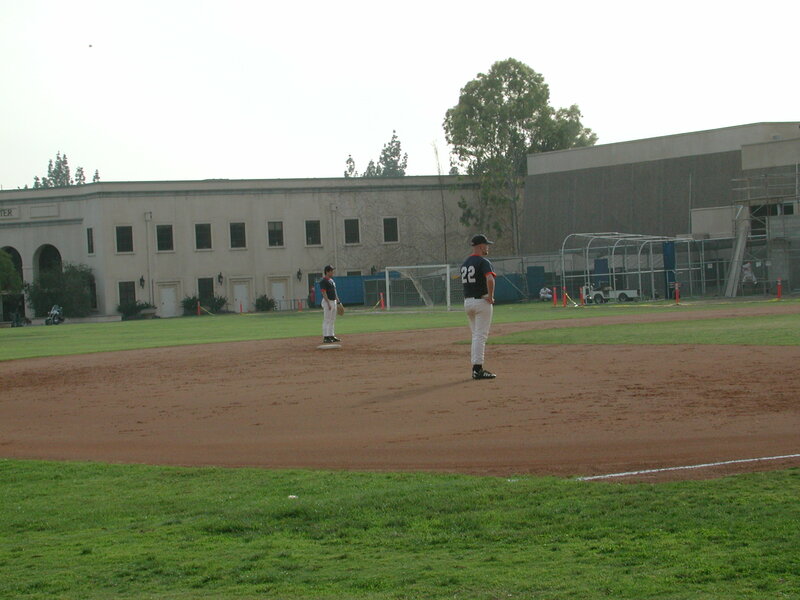 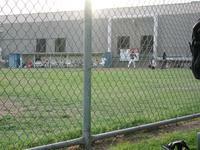 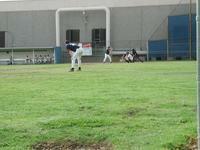 Me throwing across the diamond from 3rd base during warmups. 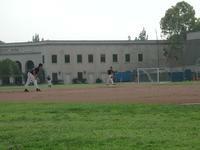 Me fielding a grounder from 3rd during warmups. 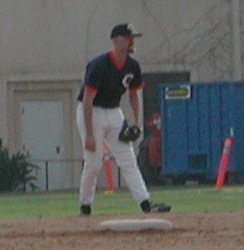 I guess that I never quite realized how dorky I looked in a baseball uniform before. 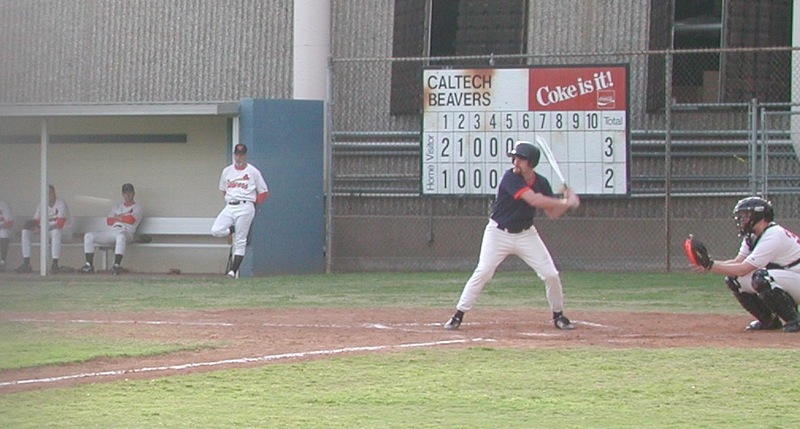 Me calling for Greg Fricke at shortstop to not relay the trhow from the outfield. 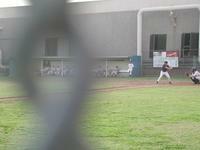 Varsity at bat, trying to drive home the run from 3rd. 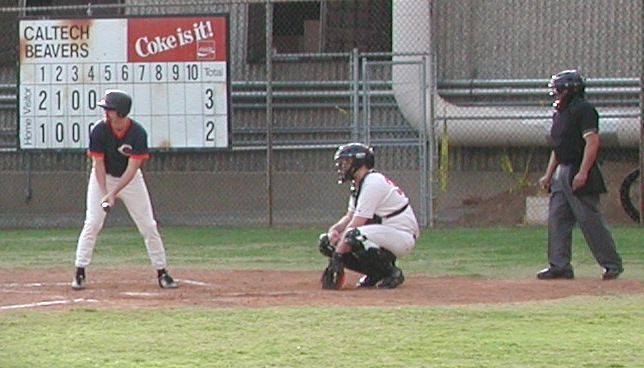 My second at-bat -- took a fastball outside corner at the knees for strike one, took a ball, then swung at a fastball low and outside. On the lookout for a curve ball, I got one about belt high on the outside corner, but got under it and flew out to left. 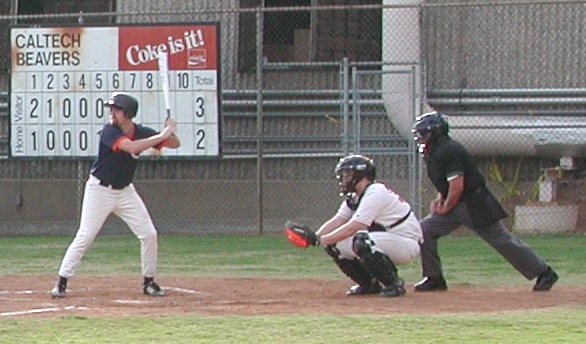 This looks like me swinging and missing at the low-outside job, but it could be the flyout pitch. 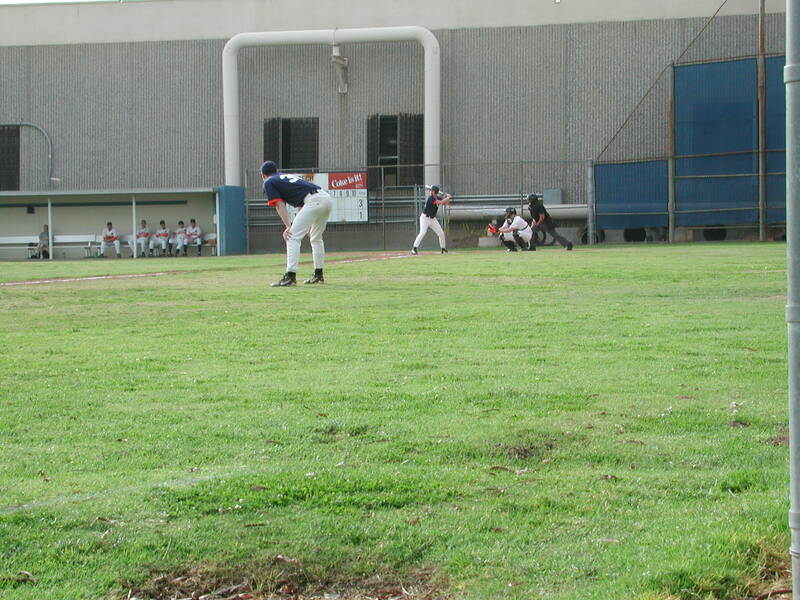 ready for a ground ball. 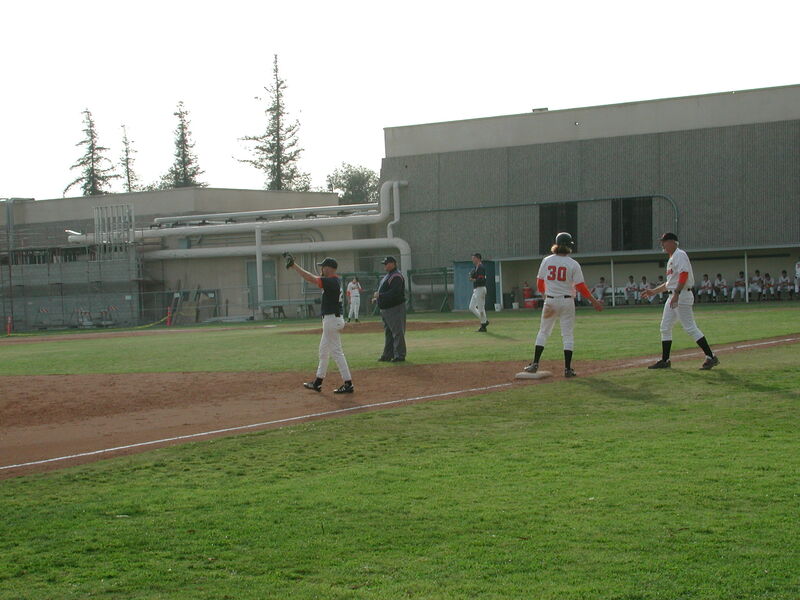 My last at bat -- runners with first and third, one out, and I get the hit-and-run sign on the first pitch! 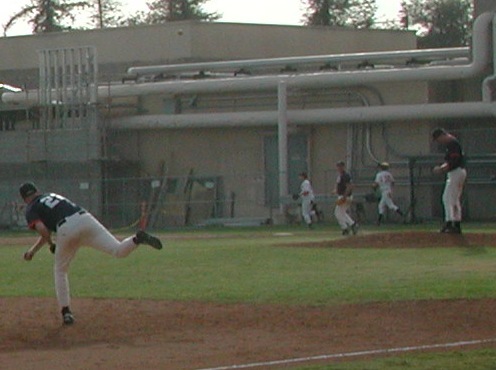 Fastball, ourside corner and maybe a little low -- looper into short left field, double scoring one and moving the other guy to third. 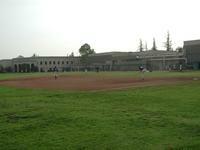 Final score 8 - 2 alums. 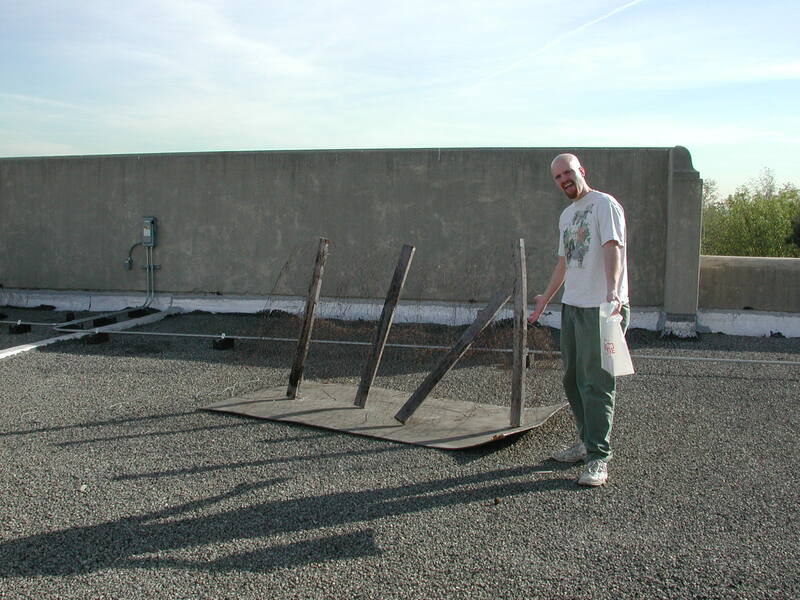 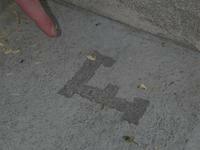 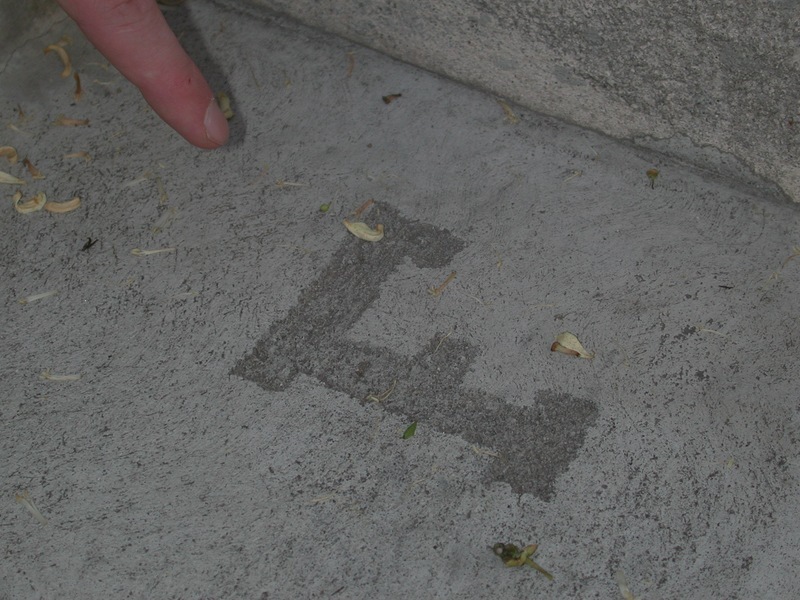 Firestone stairs 'F' in concrete. 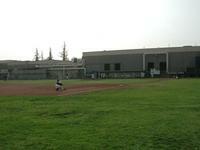 The 5/6 wall (or lack thereof). Hoth shield generator on Firestone, from my stack. 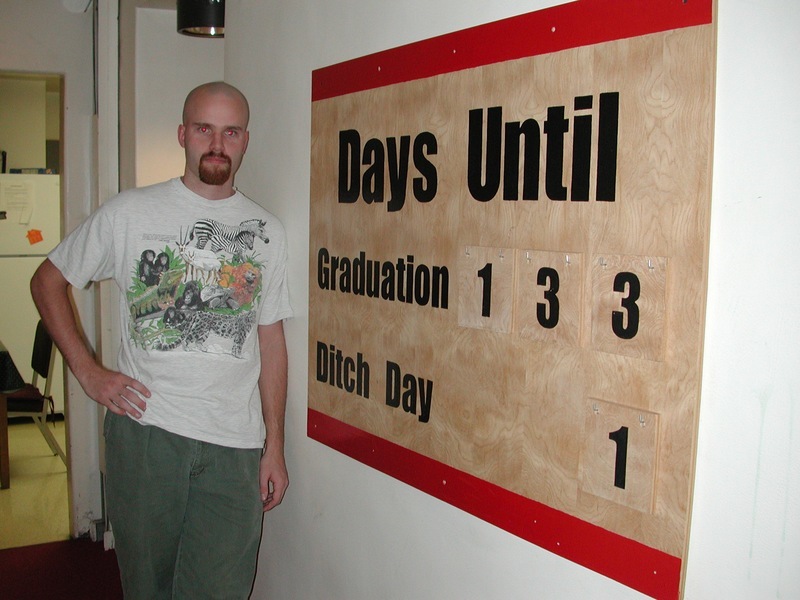 Still there after 6 years!!! 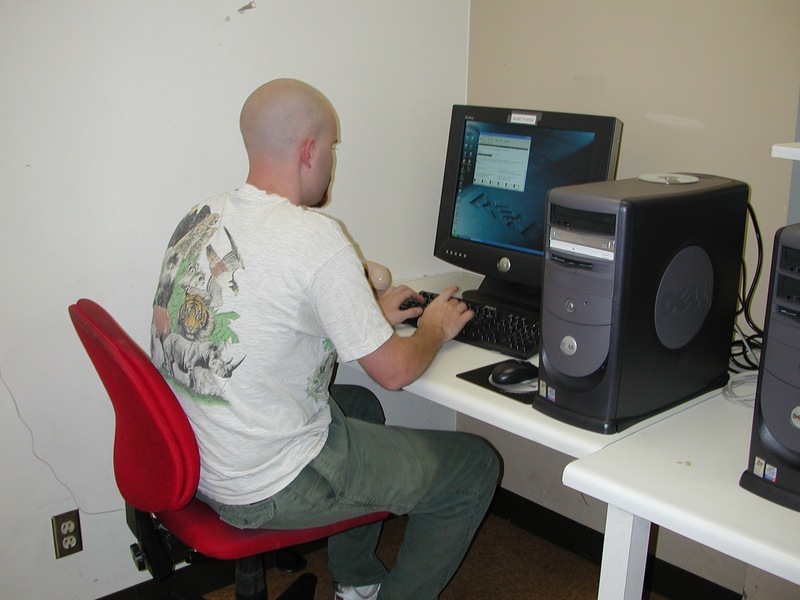 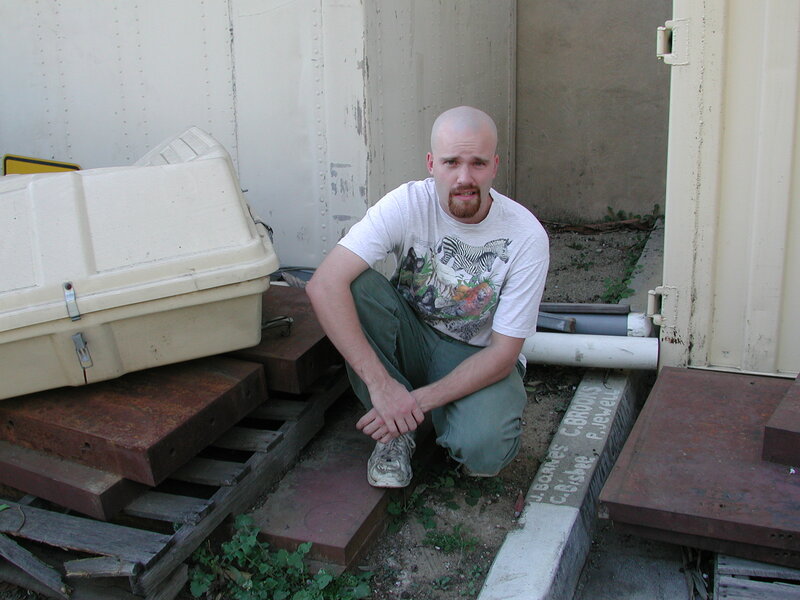 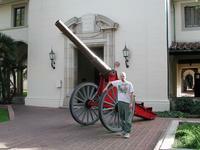 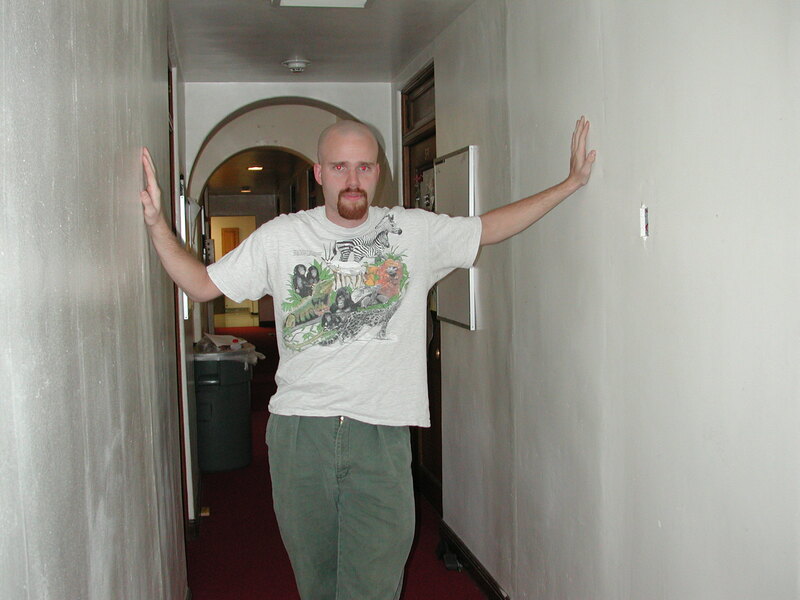 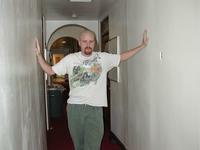 Okay, these are just random pictures -- Gwen took one of me checking my email. 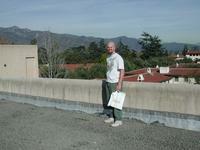 It was a gorgeous day -- no smog.